With the Brazilian Paralympics just around the corner are more disabled people engaging with sport and exercise? Who could forget David Weir propelling his way to Gold in 2012, Johnny Peacock lapping his way to take first place and Hannah Cockroft’s years of effort and training, coming good? Immediately following the 2012 Paralympics, there was a buzz, an energy and a sense of anything is possible both amongst people with disabilities as well as the able bodied community. The world was our oyster and if our mind could conceive it, our body could achieve it. One of the purported legacies of the Paralympics games was to encourage more people to take up sport, lead healthier lives and enjoy participating in a form of exercise. All of which are very commendable aims. Breakthroughs and greater awareness have definitely been visible in the last three years across the spectrum of disability topics, but there still seems to be a gap that needs to be bridged when it comes to sport and exercise. David Weir didn’t just wander onto a track one day and win gold the next. He had to find somewhere that was accessible for him to train at, equipment that was accessible for him to use, and someone who understood his disability and could point him in the direction of which exercises would be best for him to undertake so that his potential could be maximised. The simple fact of the matter is that most gyms still lack the equipment that is needed for people with disabilities to safely participate in exercise. This is a separate issue to whether or not the gym or leisure centre even has access to begin with. By this I mean disabled parking facilities, wheelchair access into the gym, wide enough doorways and large enough lifts, disabled changing facilities and a disabled toilet. Supposing you found somewhere that did have all of the above, and they do exist, you would normally have an induction with a member of staff who would explain what facilities the place had, how to use equipment as well as a discussion over which exercises and equipment would be best for your needs. 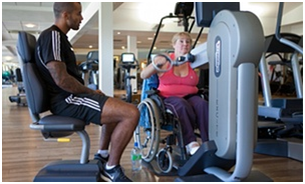 Currently, there are very few places which have staff that are trained in disabled conditions and who can advise and discuss with the individuals what their needs are and which exercises would be suitable for them. For example if you have a spinal cord injury, you may have metal work in your spine, have limited power in your trunk or upper body, and if it has been some time since your injury, secondary conditions may have begun to develop such as osteoporosis which could affect how you undertake certain exercises. A discussion with a professional who has been trained to advise in relation to disabled conditions would bridge the gap that currently exists and would be a good stepping stone to improving overall awareness and access to suitable equipment. If each place had someone who had been trained to understand a range of disabilities, the individual would feel safer undertaking exercises, which an otherwise untrained staff member may feel uneasy or unsure about discussing with them. This in turn would provide staff with a better understanding of what the needs of their members’ are and when it comes to replacing equipment they will be able to decide whether the replacement equipment should be dual functioning, i.e. a piece of equipment that both able bodied people can use as well as people with a physical disability. The reality is for that many people with a disability they are very aware of the government’s initiatives to improve public health by making more information readily accessible. A person with a disability will be aware that ideally they should be undertaking exercise several times a week but possibly be unaware of how to gain advice as to what would meet their very specific needs, and or, where locally would be able to cater to their needs. Tackling both the accessible environment as well as having a lead member of staff trained in this area would hopefully encourage more people to investigate the options and take up a sport or gym going activity. The gold standard in my opinion is the ASPIRE gym attached to Royal National Orthopeadic Hospital in Stanmore. 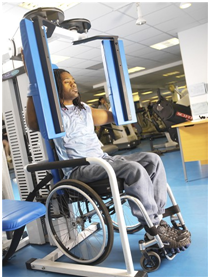 The hospital has a leading spinal injury unit and many of the patients use the gym facilities after they have been discharged. Unfortunately the gym is not in central London and for many people the distance that they would have to travel to go to the gym, prohibits them from going several times a week as many able bodied people might do. More gyms or leisure centres need to replicate this model approach and information on how to advise disabled members should be disseminated more widely to ensure every gym or leisure centre can adhere to the gold standard. Video showing how to keep fit with a disability using Aspire’s fitness instructors. Aspire’s expertise has been used by the NHS in their recent video. At Bolt Burdon Kemp we specialise in obtaining compensation for people with spinal cord injuries. We understand that maintaining a level of fitness post injury is imperative for many of our clients. We work with experts in physiotherapy, rehabilitation and accommodation to discuss the individual needs of a client. Where appropriate, evidence is obtained to demonstrate the need for our client to have access to therapists and equipment in a fully accessible environment. Raquel Siganporia heads up the Spinal Injury team at Bolt Burdon Kemp. If you or a loved one have suffered an injury as a result of someone else’s negligence or you are concerned about the treatment you have received, contact us free of charge and in confidence on 020 7288 4844 or at raquelsiganporia@boltburdonkemp.co.uk for specialist legal advice. Alternatively, you can complete this form and one of the solicitors in the Spinal Injury team will contact you. You can find out more about the team.